It's hard to think about a fresh, colourful spring bouquet without picturing tulips prominently displayed in the mix. In fact, many people consider the first flashes of bright tulips as the true measure of when springtime really begins. Said to be the third most popular type of flower worldwide, there are now an incredible number of facts and tips circulating about growing great tulips. During a successful season there are a variety of ways to include tulips in beautiful spring bouquets. Tulips are thought to have been first cultivated and then hybridized by the Turks. For this reason tulips came to symbolise the Ottoman Empire. However it is Holland, not areas of Central Asia, with which tulips are most associated today. This is because Holland has a great love of tulips and displays large flower fields full of the colourful bulbs. During the time between April and September the country also hosts a number of colourful flower parades that showcase millions of blooms. There is even a tulip museum in Holland containing great amounts of historical information on these flowers. There are over 3,000 registered varieties of cultivated tulips now registered. Of these, three main classifications of tulips exist. Early Flowering Tulips are those that bloom in March and April. Midseason Flowering Tulips are those that bloom in April and May. Late Flowering Tulips are those that bloom throughout May. Tulips are relatively easy flowers to grow as well as easy flowers with which to make colourful garden designs (due to the many different shades of blooms available). As a general rule of thumb, the bigger the bulb that is planted the bigger the bloom that will grow. Bulbs should be planted at a depth that is about twice the diameter of the bulb, and if more then one bulb is being planted then they should be spaced more than 15 centimetres apart. Other than that, nature can take its course and tulips should be allowed to grow naturally until they die. Tulips are a mainstay of spring flower bouquets. Not only can tulips of the same hue make a striking bouquet, but tulips of complementary colours create a soothing picture as well. 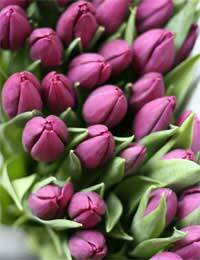 Tulips also work well with other spring flowers such as roses, delphinium, lilies, hyacinths and carnations. Tulips have long stems, so displaying bouquets including tulips usually require sturdy, upright containers. Tall vases, pitchers and flower pots are usually ideal containers for displaying such bouquets. If stems are cute very short, single blossoms in shallow containers can also be grouped together or positioned alone to create a stunning, simple centrepiece. Tulips are flowers that are easy to grow, blossom into vibrant colours and make a welcome addition to most any bouquet. For these reasons tulips are generally considered the third most popular flowers in the world. The next time you are putting together a fresh spring bouquet, see if you can include one or more tulips of varying colours to really jazz it up.